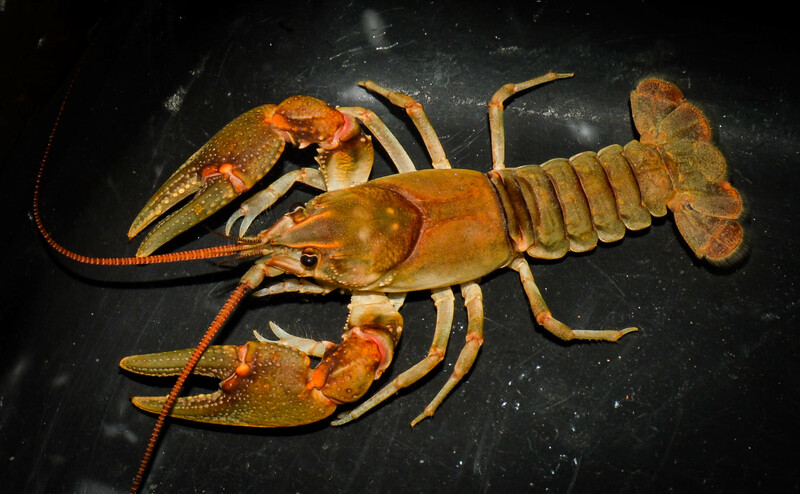 In 2016, two species of Appalachian crayfish, the Big Sandy Crayfish (Cambarus callainus) and the Guyandotte River Crayfish (C. veteranus) were awarded federal protection under the Endangered Species Act. Due to their limited range and degrading habitat, the Big Sandy Crayfish was designated as a threatened species and the Guyandotte River Crayfish was designated as an endangered species. These designations provide each species protections through United States Fish and Wildlife Service (USFWS) management and oversight of activities which may alter species distribution and/or habitat. 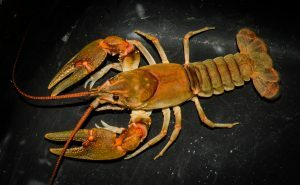 The Big Sandy Crayfish (C. callainus) was first observed in 1937 and is only known from the Big Sandy River watershed in eastern Kentucky, southwestern Virginia, and southern West Virginia. More specifically, it is only found in McDowell and Mingo Counties within West Virginia. 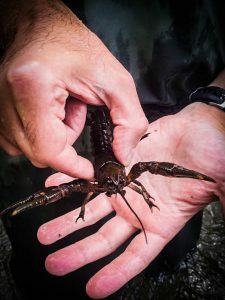 The Big Sandy Crayfish is currently considered threatened because of its potential to become endangered if populations continue to decline in number and habitats continue to become limited. The Guyandotte River Crayfish (C. veteranus) is currently only known to occur in two streams of its historic range in Wyoming County, West Virginia. The species has a well-known population in Pinnacle Creek and a recently found population in Clear Fork. The Guyandotte River Crayfish is considered to be endangered because known populations are small and are isolated from each other. This makes the species vulnerable to die-offs as result of single pollution events and lack of genetic diversity. Both species are habitat specialists, meaning they have specific habitat requirements for the establishment and success of their populations. Large slab boulders within swift moving creeks and streams are the preferred refugia for both species. Unfortunately, these habitats can become increasingly scarce as a result of increased sediments to streams such as sand and silt. In addition, historic industrial activities and poor infrastructure in the region have also resulted in water quality issues throughout each species’ historic range. With habitat availability declining, these two-protected species are forced to compete with common native crayfish species for resources and refugia. Interspecies competition can further inhibit the likelihood of their success. AllStar Ecology has a team of aquatic biologists who are certified by the USFWS to conduct threatened and endangered crayfish surveys in the southern coalfields of West Virginia and Virginia. With multiple staff members having passed identification and survey protocol testing, AllStar Ecology can deploy multiple teams of surveyors to conduct the necessary surveys. Over the past two years, our biologists have conducted numerous presence/absence surveys in McDowell, Logan, and Wyoming Counties, West Virginia for bridge enhancement projects and utility lines. 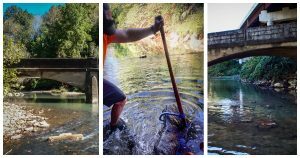 Due to the instream work associated with these projects, the surveys were necessary to avoid potential disturbance to endangered crayfish and their habitats. Having previously worked with federal and state agencies on threatened and endangered crayfish surveys, AllStar has the experience and knowledge to develop survey plans and conduct the necessary surveys to fulfill the needs of your project. Learn more about all of our services by clicking here or contact us for more information. 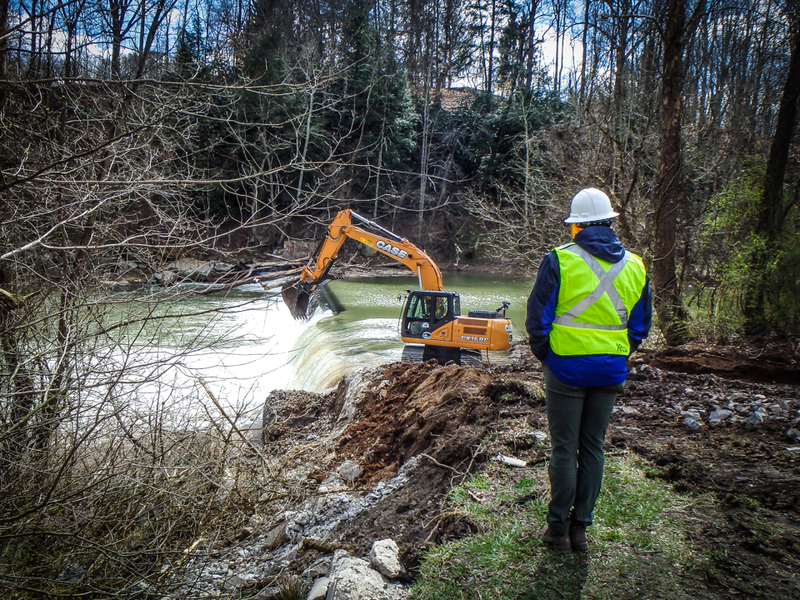 Three low-head dams (West Milford, Highland and Two Lick Dams) on the West Fork River in Harrison County, West Virginia, were planned for removal by the Clarksburg Water Board with assistance from the United States Fish & Wildlife Service (USFWS). These dams were constructed in the early 1900’s for flood control and drinking water supply but no longer served their purpose and were a hazard to recreation along the river. 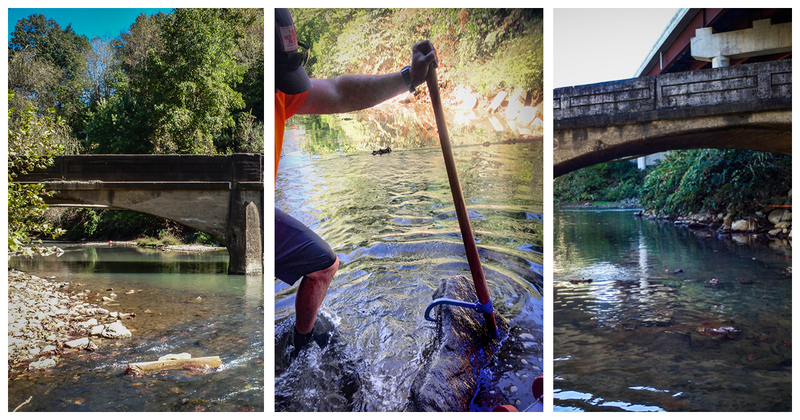 In September 2015, AllStar Ecology staff led efforts to relocate all live freshwater mussels from the work areas downstream of each dam. In West Virginia, all freshwater mussel species are now of conservation concern due to severe declines in their populations. In fact, freshwater mussels are the most imperiled species across the United States. With assistance from the USFWS and the West Virginia Division of Natural Resources (WVDNR), a total of 116 freshwater mussels of eight species were collected and relocated outside of the dam work areas. The demolition of the three dams occurred in the spring and summer of 2016. Each dam was demolished in increments so that water levels upstream receded gradually over time. This exposed 12.5 miles of river bank on the West Fork River home to freshwater mussels that were now stranded without water. AllStar Ecology, USFWS, WVDNR, and numerous other partners and volunteers used canoes with apple pickers and litter grabbers to collect stranded mussels. 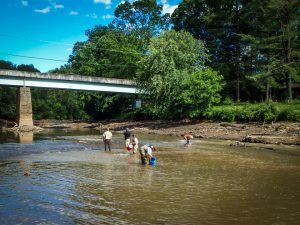 In total, 1,476 live freshwater mussels of eight species were relocated to newly exposed riffles within the West Fork River with help from 34 volunteers searching for a total of 646 hours. Removing the three dams opened a continuous 35 miles of river on the West Fork and returned 13.5 miles of lake type habitat to river type habitat. This will improve fish movement, sediment transport, and freshwater mussel populations and increase recreation opportunities. The project has also spurred the removal of tons of trash and litter from the areas and has lowered the cost of drinking water treatment for the City of Clarksburg. 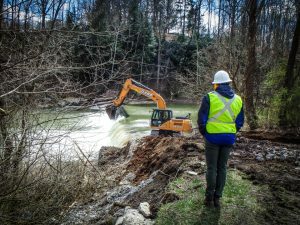 The USFWS and its partners hope to continue river restoration on the West Fork River through additional dam removal and modifications. AllStar Ecology will continue to lead efforts to relocate freshwater mussels from work areas and along exposed banks. We develop mussel survey plans and conduct the necessary surveys to fulfill the needs of various industries, land managers and the scientific community. AllStar has performed hundreds of mussel surveys throughout West Virginia, Ohio, and Pennsylvania for industries including oil and gas, utilities, loading and dredging facilities, municipalities, non-profits, and government agencies, etc. to meet the needs of our clients. Learn more about our mussel services by clicking here or contact us for more information.